Making driving more convenient: Assen's FlorijnAs project attempts to reverse decades of improvements for cyclists. Readers will have noticed that my blogging slowed down somewhat in 2015 and has not really picked up again this year so far. There are a number of reasons why, but the main reason for blogging less is that there is less good news for cyclists in Assen and across the Netherlands in general now than was the case eight years ago when this blog started. The good ideas have mostly been documented on this blog - see past posts (in the section on the right). This blog post describes a large scheme in Assen which is damaging the city, but please do read to the bottom as there's a long way still to fall. Traffic in Assen in May 1979. Many readers will see similarities between this film and the appearance of their own city. I certainly see similarities between the film and British cities. Before and after images of some of the same locations can be found here and here. started to improve safety and people started cycling more. 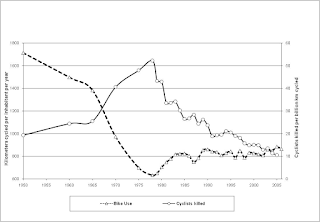 In most countries, bicycles reached their peak in the first half of the 20th century before being pushed aside in the second half of the 20th century. The year in which the Dutch cycled the least was one year before the film above was shot:1978. Why had cycling become less attractive ? Because policies which favoured cars had resulted in Dutch roads being clogged with motor vehicles. I think the film illustrates the answer very well. Cycling conditions were unpleasant because cyclists were only rarely separated from motor traffic. 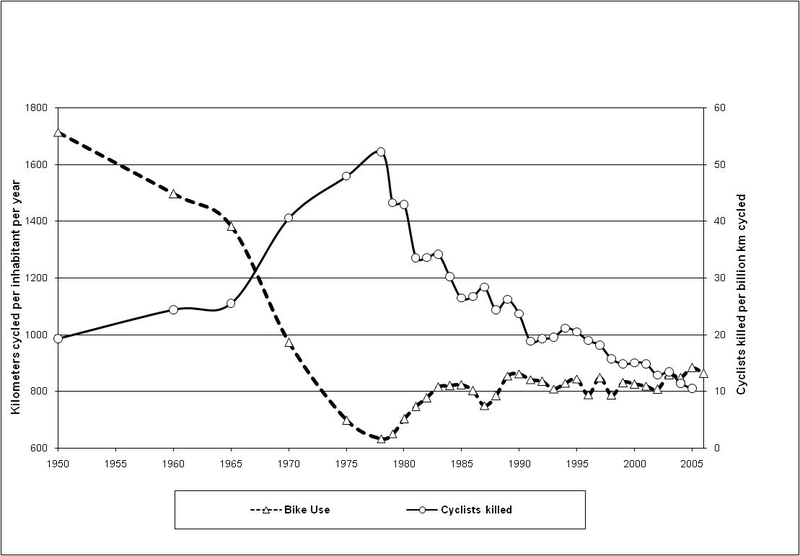 The resulting conditions not only made cycling unpleasant due to low subjective safety scaring people away from cycling, but also led to the highest number of deaths per km travelled by bike that was ever recorded in the Netherlands. Dutch cities belonged to drivers in the 1970s. 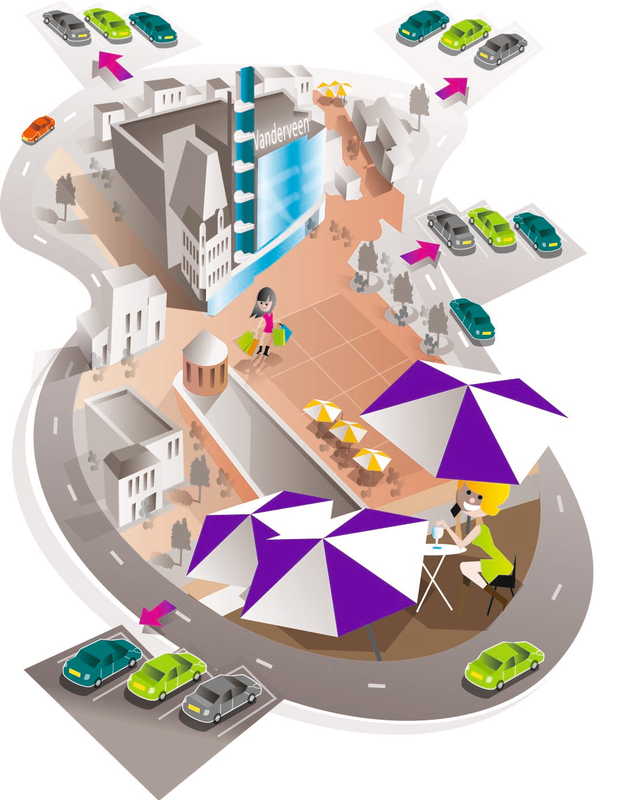 A policy change resulted in a second revolution on Dutch city centre streets which reversed this. The rest is history: City centres were returned to cyclists and pedestrians, and because the rest of the country was covered by a comprehensive grid of safe cycling infrastructure this enabled safe access to the city centre, even by children riding their own bikes. It was only by implementing policies which prioritized cycling and deliberately improved the safety of cyclists that conditions in Dutch cities were changed from the unpleasant scenes seen in the film above. There are twice as many cars in the Netherlands now as there were when the film above was made, but cycling is far more pleasant and far safer these days than it was then. However this doesn't mean the battle was won and that everything is going well. In fact, some of the lessons of the 1970s and 1980s are now being ignored in the Netherlands. New infrastructure which makes cycling less convenient and less safe is now being built. full due to the change in policy. But who benefits from this ? The FlorijnAs project in Assen is changing a lot of the infrastructure in the city in an adverse way. It's difficult to find anything positive at all about this project. Last year's change in car parking policy has also led to problems for cyclists (I predicted this last year). Removing the out-of-town-center free parking and replacing it with half price (€6 for the whole day) inner city parking has, you won't be surprised to read, led to far more cars being along the inner ring road and into the inner city. The increased parking in the centre has not benefitted the council because while the car parks and roads leading to them are now busier than they were, the total income from car parking has actually dropped by €100K per year as a result of the new policy. It also doesn't benefit shop-keepers because now that drivers use only the free tickets from the supermarkets to quickly do their shopping, they don't wander around to other shops and spend money there as well. The out of centre free parking used to enable this. Of course this policy which brings more cars to the city centre certainly doesn't help cyclists. To add to the woes of the businesses in the centre of Assen, the council is supporting the building of an outlet centre on the outskirts of the city which of course will offer free parking and will help to ensure that out-of-towners use Assen's shops even less than now. The Molenbrug provides part of a main route to the city centre for people from the North-East. The narrowing of the bridge had already taken place when I wrote about this bridge last year, but at that time we still had a traffic light to stop cars. Now that the traffic light has gone as well, cyclists have less priority and worse safety than in the past. The removal of separate pedestrian facilities here also means that at busy times this bridge demonstrates all the problems which come from shared pedestrian and bicycle facilities. The most dangerous junctions in Assen are uncontrolled crossings. One of them is further along this route to the North West and caused a fatality in 2009. Read more about how the Molenbrug used to be. Assen's roundabouts are all of a particularly safe design except for the two new roundabouts which resulted from the FlorijnAs project. These use an inferior design without a central waiting area which makes them dangerous for cyclists to cross. How did Assen lose the ability to construct safe roundabouts ? In this case, the new roundabout has replaced what was a direct priority non-stop through route for cyclists so this also causes an extra delay on a busy cycling route. This road is being doubled in width. For motorists there will be two lanes in each direction plus a wide verge in the centre with attractive trees and a new row of car parking spaces which can be seen on the left of this picture. For cyclists, the new scheme brings the cycle-path on the left which is being built a fraction under the supposed minimum width of 3 m (which is actually too narrow for convenience). Cycling infrastructure should support side-by-side cycling because this makes cycling more sociable and more attractive. This path is on one of the busiest routes in Assen but at under three metres wide this has been built too narrow for side-by-side cyclists going in both directions, too narrow for safe overtaking. and the lamp-posts are ludicrously close to the path itself. To the right, six lanes for drivers (one parking + two driving lanes + a verge + two driving lanes), all of which are wider than the cycle-path. Jan Fabriciusstraat provides access from the East to the city centre. This very wide and busy road has space for multiple vehicle lanes, a grass verge in the centre for much of its length and pavements (sidewalks) of up to 10 m in width, yet cyclists have nothing but a 1.3 m wide on-road cycle-lane which is magnetically attractive for parking trucks. This is an example of wide pavement syndrome. to make a 130 degree turn on a very narrow path. Where parking is provided, it is parallel to and right next to the cycle-lane, placing cyclists in danger from drivers who are concentrating on parking. The cyclists in the second photo who are heading in the wrong direction are children on the way to school. They are riding in this way because the planner of this street somehow couldn't find any way to enable a safe and convenient journey to be made by bike from the road next to the tall building on the left to the position where I am standing. Note that where the woman in red is standing there was once a wide good quality cycle-path which was removed when this street was redeveloped. Assen's railway station, built in 1989, is currently being demolished to make room for a new building. Most cyclists and most drivers in the station area do not have the railway station as their destination but are passing through, so direct through routes are important for both cyclists and drivers. This video shows the direct routes South to North and East to West which existed across the station area at the beginning of 2015. They're old-fashioned, but efficient. The East-West route dumped cyclists into Stationstraat, a road which was also used by busses, but it was a wide road and unpleasant overtaking events were rare. The new station plans include a tunnel so that drivers will benefit from an improved direct through route past the station. Cyclists making through journeys have their route made less direct and have to "share" a pedestrian area. Those heading East to West will then have to "share" a newly narrowed road with busses. Also note that for cyclists the infrastructure of the future is built of bumpy tiles, not of smooth asphalt. 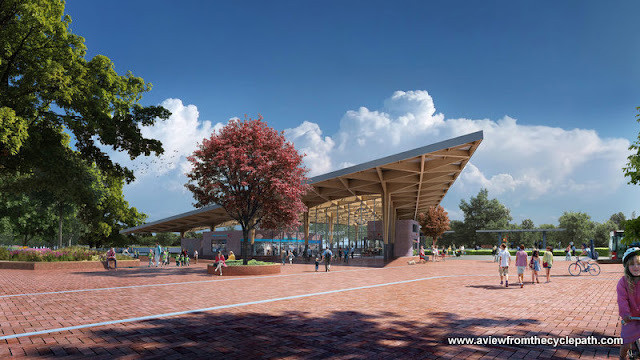 The architect's impression of the new station. This is a road which will be used by taxis and busses en-masse. Anyone dropping off a train or bus passenger by car will do that right here in the middle of the picture in this shared space. Cyclists will have to make their way through this. According to the architect, people will bring cats to the station. I suspect this will never actually happen in practice. Update February 2019: The railway station has some of the problems described above. There is some conflict with people using the underground cycle-parking and those travelling through the tunnel by bike. However overall I think this has actually worked out quite well. Read a new blog post about the railway station. South East: Zuidersingel (which leads into Oostersingel) was narrowed and resurfaced in 2013 as part of the works which gave us the unpleasant Kerkplein shared space. The result of this work is that cyclists now find themselves used as mobile traffic calming devices. As I type this, the Zuidersingel layout is already being copied around the corner in Stationstraat as part of the new station development. As a result, the problems for cyclists which already exist in Zuidersingel/Oostersingel will also be seen in Stationstraat which is part of the main route to the city centre for most people who live in the East of Assen. It seems to be taking an awfully long tome for people to realise that "sharing" really doesn't work on busy through routes. The Kerkplein Shared Space already serves as a barrier for people from the South who wish to enter the centre of Assen. With the new parking regime, the amount of traffic here has grown and with the extra traffic the unpleasantness of trying to negotiate this junction has also grown. Read more about the Kerkplein. Constant conflict with pedestrians because while there is a separate pedestrian path, that path is so badly designed (it's down some steps by the water) that almost no pedestrians use it. Because the corner radii are far too small, people have made their own path which after a few months already looked nearly as permanent as the real path. This is an indicator of badly designed / not fit for purpose infrastructure. The replacement primary route is on the other side of the canal. Yes, it initially looks OK. However, the details are all wrong. Why have cyclists been short-changed in width once again on a primary cycling route when there is so much space available ? Why has the cycle-path been positioned so close to the road and so close to lamp posts ? Why is there a loading bay on the wrong side of the cycle-path when the empty shop which it is next to has its loading bay in a car park on the other side ? There is no reason to expect large numbers of pedestrians here so the pavement is overly generous. Further along the same path cyclists have to give way twice to car park entrances. No priority on a primary cycling route. The old primary route on the other side of the canal worked better than this. Watch a video which shows what remains of the old route, which has been given a rougher surface than in the past. What future for Assen ? I am quite aware that some readers will look at the photos and videos above and wish that they had the same problems as Assen does. Clearly none of the problems shown above quite take us back to how the Netherlands looked in the 1970s. However, they all illustrate new problems which are being created for cyclists in this city due to cycling just not mattering very much to planners and motoring being given a higher priority. If this process continues then it could easily lead to a slow slide downwards in the cycling modal share. People don't have to experience much unpleasantness when cycling to make them give up. Infrastructure which was built 5-10 years ago was of a higher quality than what is being built now. There is no good reason for this. Certainly not a financial reason as FlorijnAs is an astonishingly well funded project which has a total of €1.5 Billion to spend. 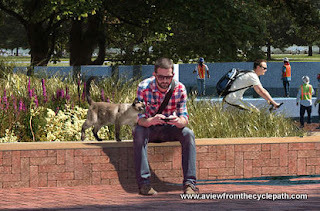 The high level of funding combined with any downward change in quality is a serious concern as the extensive works of FlorijnAs will affect all cyclists in Assen and they already put the city back a small step so far as cycling is concerned. I'm not very concerned as FlorijnAs isn't all of Assen and this still remains a city which overall is lucky enough to have amongst the very best infrastructure in the world. A few small steps backwards won't make a huge difference so long as the ambition to improve is found again. As I understand it, Assen's previously stated ambition to grow cycling still stands. If this is more than mere words then the city needs to do better than what is shown above to retain present and encourage future cyclists. What future for other cities ? One of the problems with writing about the less good developments in this city is that some readers gain an impression that it is only Assen which is making mistakes. That is of course not true - it's just that I'm an trying to give an honest appraisal of the place where I live and there are not so many people doing this. Positive stories abound, including about things which are really not very good at all. my chair when I read this... Not what you want to emulate. There is nothing uniquely Assen about any of the problems illustrated above. The architects and planners who designed the infrastructure illustrated above also work elsewhere and they are doing pretty much exactly the same thing in several other cities while other planners and architects are making other mistakes here and elsewhere. It's quite normal that ideas wax and wane in popularity. In the Netherlands at the moment, cycling is not the big thing which politicians are trying to improve. For that reason we should not be surprised that this period of time doesn't bring the best improvements for cyclists. However it is important that the attitudes change before too much harm is done. Keep going backwards at this rate and in forty years time the Netherlands will once again look as it did in the 1970s. Yes, there are study tours again this year. While this blog post points out problems within Assen, this is still a city choc full of good examples. We also visit Groningen, which like any city is also a mix of good and bad and has plenty of its own problems. The majority of both cities work well and this is reflected in the high cycling modal shares. In any case, looking at problem areas gives us an opportunity to demonstrate how what might be seen as rather small issues ("wish I had that problem") actually really are important if a truly high cycling modal share is your aim. There are still some places available on the April tour, but you will have to be quick to book. Similarly, there are also still places available on the May follow-up tour (contact us for details) on which we demonstrate what changed since your previous study tour. Our service is to demonstrate what is good and also show what works less well so that participants know what should not be emulated. It's important to bear in mind that not everything Dutch is good. From every period there are both very good examples and also some poor examples. We have nothing to gain from implying that any infrastructure which is less than excellent works well enough and you can rest assured that we do not gloss over problems. I hope that the above blog post makes that clear.